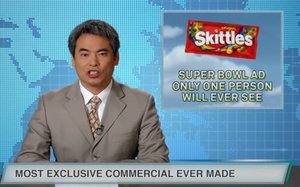 The candy brand swears that it’s made a “real, multimillion-dollar Super Bowl ad,” featuring a (yet to be revealed) celebrity, that’s on par with the sophistication of its previous SB ads, but will be viewed by just one Skittles fan. The solo viewer is Marcos Menendez, a 17 year old from Canoga Park, Calif., chosen because he’s a real Skittles fan, according to the brand. More to the point, Skittles is using this video, plus four other teaser ads to be released over the next two weeks, to drive buzz and viewership for a livestreamed event on its Facebook channel on Super Bowl Sunday. Viewers will get to see Menendez’s reaction as he views the exclusive 60-second ad for the first time. The teasers will also feature and reveal the identify of the celebrity who stars in the single-viewer ad. In what may be an early hint, a brand rep points out that, after “finding out” about the exclusive ad, NFL star and Skittles “superfan” Marshawn Lynch tweeted at Menendez to say he wants to join the solo viewing party. This will be the first time since 2014 that Skittles, the official candy of the NFL, will not be airing an ad during the Super Bowl. So far, M&M’s — which gave fans the news in an ad run during The Critics’ Choice Awards on Jan. 11 — is the sole Mars Wrigley brand that’s announced it will air an ad during the Super Bowl.